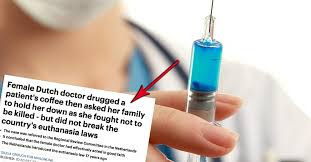 Euthanasia Prevention Coalition Euthanasia Prevention Coalition: Dutch doctor who euthanized woman with dementia without consent is being prosecuted. Dutch doctor who euthanized woman with dementia without consent is being prosecuted. A doctor who secretly slipped a sedative into a 74-year-old woman’s coffee before administering a lethal drug as members of her family held her down is to be the first medic to be prosecuted for breaching Dutch euthanasia laws. In January 2017, a Netherlands Regional Euthanasia Review Committee decided that the forced euthanasia on a woman with dementia, where the doctor sedated the woman by secretly putting the drugs in her coffee, and then asked the family to hold her down in order to lethally inject her, was done in "good faith." Dutch doctor reprimanded for euthanasia without consent of woman with dementia. Her family was required to hold her down so the doctor could lethally inject her. The Regional Review Committee found that the doctor contravened the law but that it was done in "good faith." Jacob Kohnstamm, who was the chair of the Regional Euthanasia Review Committee wanted the case heard by the court to establish a precedent concerning cases when a doctor lethally injects a person with dementia. It is common for the Netherlands court to hear a case, not with the intention of punishing the person who broke the law but rather to establish a precedent to determine what the court considers acceptable or unacceptable, based on the application of the Netherlands euthanasia law. This outcome of this case will likely effect Canadian euthanasia policies. The Canadian government is debating the extension of euthanasia to incompetent people who previously requested euthanasia while competent. How could a doctor act "in good faith" when the person said repeatedly that she didn't want to die. She Was not in a state where she did not know what was happening to her. the doctor and family who held her down are complicit inb her murder. There is no good faith here, only a desire to eliminate a problem.